Octopuses and squid, both mollusks that don't use shells, are efficient predators. Some can change color to help blend into the background, protecting them from their own predators while aiding them in their hunts. But the most obvious adaptation for feeding is their tentacles. Octopuses and squid have different types of tentacles, but they are both well-designed to catch prey. Both octopuses and squid have tentacles; an octopus has eight that are usually identical, while most squid have eight shorter tentacles and two longer ones. These tentacles are typically covered in suction cups to aid in grabbing fish and crustaceans, although some squid have sharp hooks at the end of the longer tentacles. An octopus' suction cups are equipped with taste buds so he instantly knows if what he caught is worth eating before killing it. 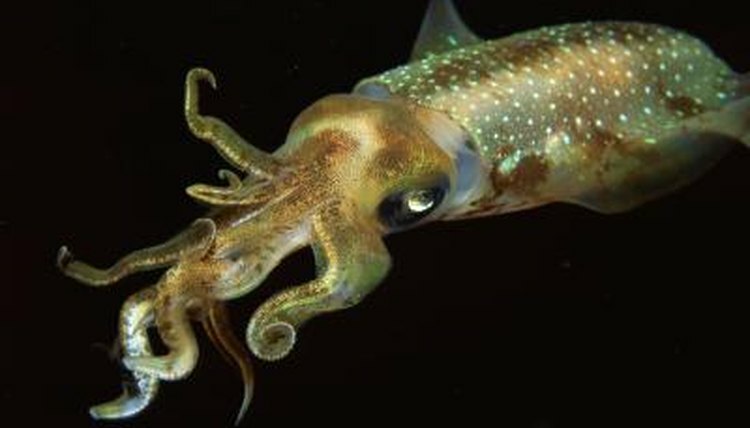 A squid's two long tentacles give it more options when hunting; he can shoot out the tentacles quickly to grab a fish swimming by, or swim above a school of fish and dangle his long tentacles until a fish swims close enough to snag. Octopuses and squid have hard, sharp beaks, similar to a parrot's, that help them eat. These beaks enable the mollusks to break open the hard shells of crabs and other crustaceans. Many use their beaks to help break up food as well, swallowing the smaller pieces whole. These beaks are the only hard parts of these mollusks' bodies. Both mollusks have small mouths that don't allow them to eat their victims whole. Instead, they must break the food into smaller pieces before ingesting it. Squid often use their shorter tentacles, otherwise known as arms, to break apart their food and push it in toward their beaks. Octopuses tend to break apart meat with their beaks before eating the smaller bites, often aided by salivary enzymes they inject into crustaceans to loosen the meat inside the shells. Some octopuses also have poison they inject into their victims to paralyze or kill them quickly. Squid and octopuses have remarkably good eyesight. Many sea creatures have developed eyes that have blind spots, but octopuses and squid don't have that problem; they are similar to vertebrates that way. This helps them see prey in a full range of vision. Their high number of photoreceptors let them see well in low light, but they don't see in color. There are no cones to spot color changes, but they can distinguish shapes through changes in dark and light shades.